Whether you’re planning a small intimate reception or an extravaganza for hundreds, Expresso has the expertise to ensure you have a great party! We love catering for weddings! First of all, when it comes to catering for weddings there’s no such thing as a standard Expresso package – we’ll devise a bespoke menu especially for you. So whatever you’re thinking of – perhaps a traditional sit-down meal, sharing feast, vintage afternoon tea, street food, grazing table – or a combination, give us a call. 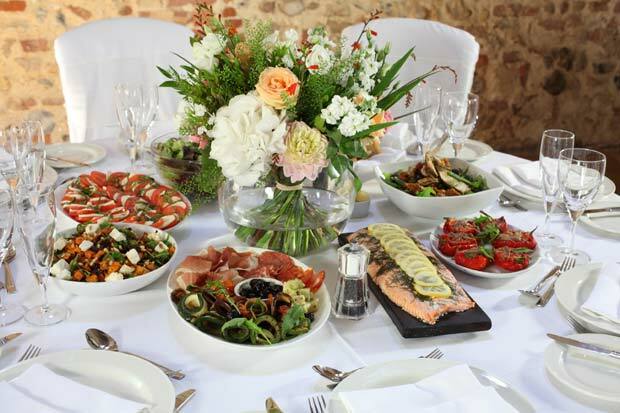 With over 25 years’ experience in high quality, special event catering you can rely on us to deliver. Wedding and civil partnership celebrations regularly take us across Norfolk and North Suffolk, to a range of venues from private homes to country houses, marquees to medieval buildings. On the big day itself we’re able to take care of everything – from the reception drinks through to your late night buffet and bar – ensuring you and your guests are well cared for from start to finish. Looking for inspiration? Take a look at our sample menus, based on special events we’ve recently catered for in Norfolk. And of course, as well as great food we can also supply all the extras – including staff, furniture, tableware, linen, glasses and drinks – along with vintage china! Articles to help you plan your big day! - Buffet v Sit Down Meal – we examine the pros and cons!